Welcome! I’m the last stop on this year’s teal mini quilt blog hop. Yay caboose! This swap, hosted by Beth of EvaPaige Quilt Designs, raised $2,000 and awareness for ovarian cancer. The quilts in this post were exchanged between me and my new friend Sarah. Here’s the quilt she made me. It’s double sided! Sarah lost her mother to Ovarian Cancer. She has a Pinterest Board dedicated to awareness for this specific disease. I encourage you to check it out. The biggest predictor of successful treatment is early detection and there’s no medical tool that catches it in the earliest stages. Pay attention to your body women of the world! If you feel like there’s something amiss get it checked out. My survivor friend Trisha’s here today in part because she was paying attention and became her own advocate. Ready to see what I made? I had a back injury while I was making this quilt so it’s 100% hand sewn. 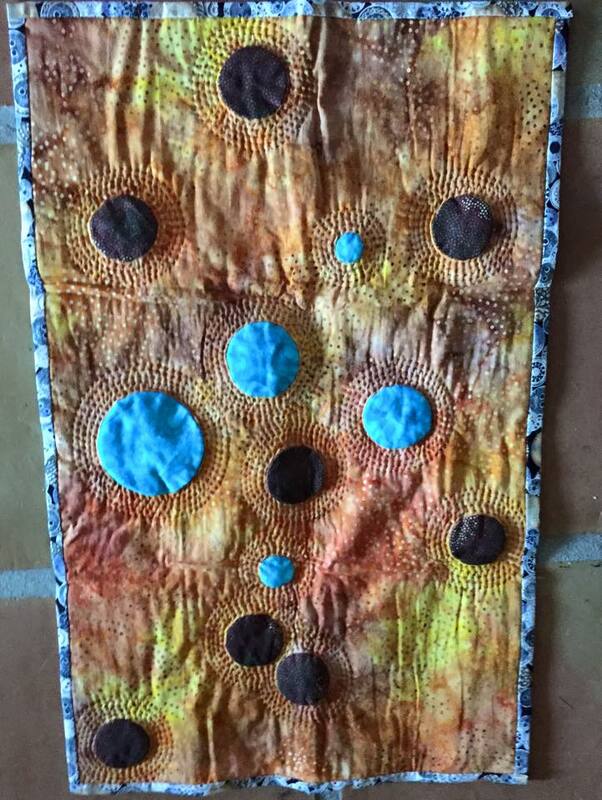 I started with some teal yo-yo’s and a contrasting orange batik background fabric. It needed s’more circles but I wanted the teal to be the star so I chose brown. After playing with the placement for a bit I appliqued those yo-yo’s upside down onto the fabric. They’re dimensional and a bit poufy which is fun. I wanted the thread to stand out a little so you could see the quilting but not too much. So I auditioned them like so. It’s helpful to unwind a bit of thread to see what the strand looks like against the piece. The red’s too bright on the spool but just perfect this way and it’s what I ended up choosing to quilt with. Double-fold binding is my jam but it was going to be a pain to sew on entirely by hand so I decided to fold the back over onto the front instead. Usually I’d use a gazillion pins to hold it in place but I saw a cool new thing on Sam Hunter’s Back to School Blog Hop. It’s glue basting and it’s pretty amazing. I learned on the tutorial from purpledaisyquilting in minutes. 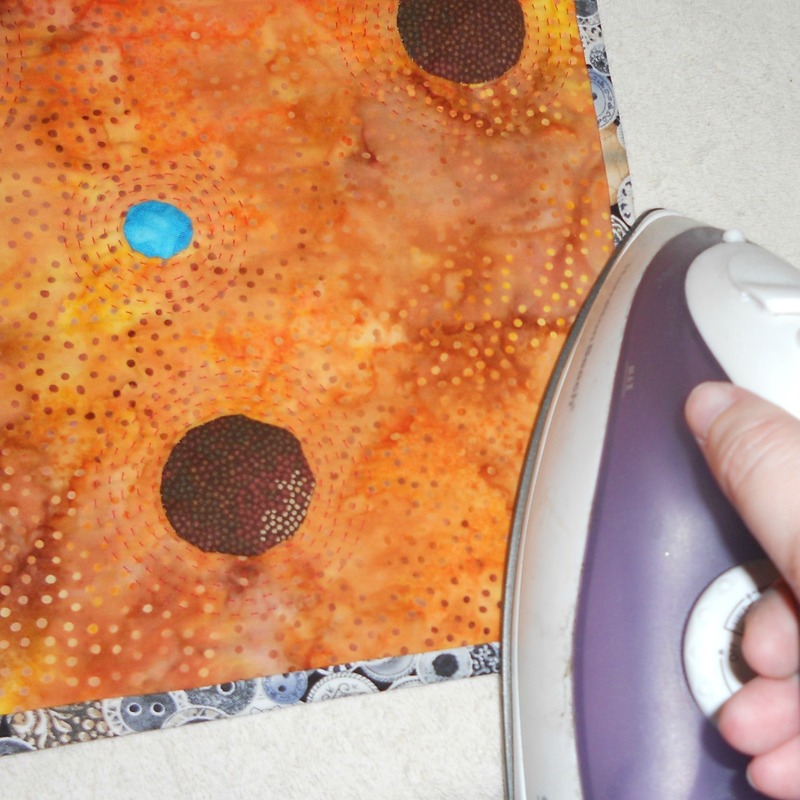 All you need is Elmer’s glue and a hot iron. I found these cute fine-tipped ones at the dollar store. Score! Here’s a nice close-up I took while doing the final pressing and the finished quilt. There’s no right side up; It can be hung vertically or horizontally. Can you see the concentric circles quilting? No? How ’bout in this pic Sarah took upon receiving it? It got a little smushed in the mail but this is a much better angle to show off my handiwork. Pretty cool. Check out these links for the other artists in this blog hop and mark your calendars for August 2016 to participate in next year’s swap. Sign-up via Facebook. October 16th Blue Ribbon Sewing and quiltartbymegan <— you are here! This entry was posted in Applique, Art, Challenges, Custom Work and tagged applique, art quilts, artist, blog hop, cancer, cancer awareness, design, friends, glue basting, hand quilting, handwork, making friends, mini quilt, mini quilt swap, ovarian cancer, quilt art, quilt swap, swap, teal mini quilt swap, wall hanging, yo-yo's on October 16, 2015 by quiltartbymegan.